This dance was staged for the first time in September 1933 at the Tôkyô Gekijô [more details]. It was revived by Onoe Kikugorô VI's son-in-law Nakamura Kanzaburô XVII, who used a different music accompaniment, which was written by Kineya Eizô. This modern dance-play was patterned after the farcial interludes which relieve the solemnity of the Nô drama. A grand lady and her two servants are out viewing the cherry-blossoms. 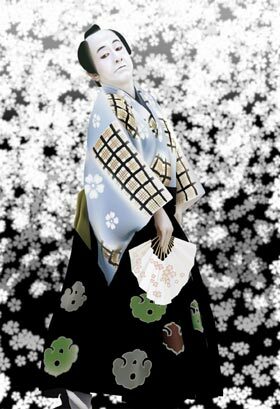 Wishing to enjoy a cup of sake, the lady calls for a takatsuki, the pedestal upon which the cup is placed. Finding that it has been forgotten, she sends one of her servants after it. This particular servant has no idea what a takatsuki is but he passes a wooden-clog peddler crying his wares and mistakes the clogs (takaashi) for the pedestals. Overjoyed at having finally found what he thinks his mistress wants, he and the clogdealer drink up the sake. When the lady finally locates the missing servant, she finds him completely drunk.